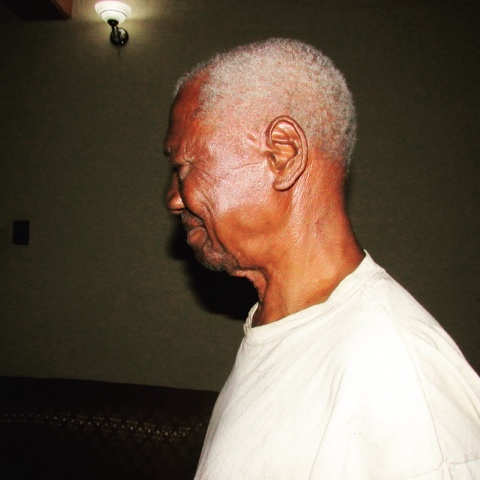 I interviewed the second oldest man in my (Umunna) kindred or children of the same father. A kindred is made up of many families that descend from the same paternal lineage . Normally , the kindred is named after the original descendant . Using the word : Umu (children) plus the name of the person. My village is Okwu Nguru and within Okwu Nguru there are 11 kindreds. My kindred is called Umu Olu after my great great great grandfather named Olumba. Today , some of the people in our kindred are not original inhabitants of our land . Some are visitors who eventually found themselves settled amongst my descendants . I don't know where Olumba came from or why he settled there but that is where my people today find themselves . Christopher was very excited that someone like me would be interested in collecting family and village history . My grandfather (Egwim) was his father's younger brother so we are related by blood. His grandfather (Chileke) was the son of Olumba. I couldn't go farther back than Olumba .I noticed that he was suffering from what may be Alzheimers . When asked specific questions , he would respond that his memory was no longer sharp anymore . But what he did remember was every single one of his children's and grandchildren's accomplishments . He could recall all of their names and their respective locations . To him , his children are his biggest gift. And what bigger gift than grandchildren to reap all your hard work . My great grandfathers son was the first teacher in Okwu Nguru but died from influenza in 1918 the day school started. (*cough cough * disease brought by the Europeans that killed about 3% of the population ). In fact I have several relatives who died during this time . Christopher followed his path and became a primary school teacher in 1946. He trained so many children who would go on to be lawyers , doctors , engineers , and teachers. Christopher retired in 1984 at the age of 60. Initially the government was paying him a portion of his pension but since September 2002, he has not received dime from the government . For the past 14 years ,he has been struggling because he has no source of income. Rather he has to depend on others for his basic needs. Luckily , the majority of people who live in my village (Okwu Nguru) are farmers and own their land . As a result , people are able to grow and share their own resources which has enabled the community to sustain itself . However , he is emotionally distraught that he has been cut off from the government with no repercussion . I was particularly interested in the village and kindred traditions . Before he could answer , his nephew chimed in . He explained how many traditions have continued to died due to lack of interest by the youth . He told me that the youth for more concerned with western education which resulted in them looking down on village traditions . I found this ironic and interesting considering Christopher came from a long line of educators . His nephew said that his generation and Christopher's generation were concerned with the moral upbringing of the whole community . This idea of moral upbringing is often juxtaposed with barbaric uncivilized Igbo traditions . Christopher told me that he taught all subjects . I asked him if there was any subjects or classes on African history and tradition or colonization/slavery . He said no . I wondered how these now elders could speak negatively about the youth when they created an environment which would lead to the abandonment of culture and the embracing of western ideals . The first schools were built by the same people who colonized the Igbos. I am reminded of a school near my village that is currently closed . The school is closed because the Catholic Church refuses to allow the local community to operate the school . Thus , the local community refuses to attend . Because Christopher was born during colonization and into Catholicism , it was difficult to talk about colonization and the effects on the social structure of the village . Also, he told me preferred not to revisit the past as he's endured a lot of stress in his life and because he has a hard time remembering things . I presume that a generation or two before him , elders like himself were jailed or killed for trying to hold onto their beliefs . Considering one of my relatives was set to be a teacher in 1918, I don't think my family was among those who died fighting which makes me wonder where I get my rebellious nature from . In 1901, the British set out to colonize/takeover Igboland coined the Aro Expedition . The British faced a lot of resistance in Mbaise (my town) and surrounding towns which resulted in the Ahiara massacre in 1906 killing hundreds and burning whole villages . Shortly after , the British took a more "peaceful" approach to colonization and conquest. So it is of no surprise that the subsequent generations would feel indifferent or be heavily invested in adapting western values and ideals or not see colonization in a negative light. Other interviewees told me that eventually the majority of the village converted to Catholicism because of the opportunities for income and education that the first adopters received .